Based on the best-selling crime thriller books by Tess Gerritsen, Rizzoli & Isles focuses on tough-as-nails Boston police detective Jane Rizzoli (Harmon), who has an uncompromisingly brash and beautiful bull-in-a-china-shop approach to both cases and life, and the brilliant medical examiner from a privileged background, Dr. Maura Isles (Alexander), who may be the best-dressed science nerd in New England. Together they are close friends and complete opposites who solve some of Boston’s most notorious crimes. 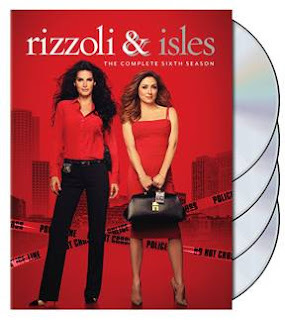 In Rizzoli & Isles: The Complete Sixth Season, Jane and Maura are put in charge of investigating a number of challenging criminal cases. The duo gets wrapped up in the world of competitive bass fishing when a leading champion tournament fisherman is killed. The team must solve the murder of a victim who is found buried in a shallow grave. When a teenage girl’s body is found inside of a cage, the duo sets out to find her killer. Jane and Maura investigate the murder of a college student, who they learn had 32 girlfriends. The duo’s detective skills are put to the test when they investigate the case of a dog trainer who is found dead at her home and the prime suspect is her champion Rottweiler. Jane and Maura travel to Los Angeles to investigate a murder that has connections to Boston. Season six is loaded with several more captivating new cases that promise to keep viewers on the edge of their seats.